The New Testament is filled with references to God’s saving love, particularly in the letters to the churches (Romans through Revelation). This love is usually mentioned with specific reference to a target audience designated by the pronouns we, you, or us. (for example, Rom. 5:8 – 8:39; Eph. 2:4-5; 5:2; 1 John 3:1; 1 John 3:16; 1 John 4:10,19). First, as I mentioned before, these passages are found in letters addressed to congregations of believers, not to people in general. 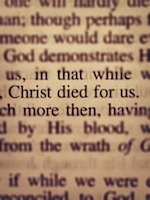 Romans 5:8 stands as an example of both points: “But God demonstrates His own love toward us, in that while we were yet sinners, Christ died for us.” In that well-known biblical sentence, the pronoun us is used twice and we is used once, all referring to those for whom Christ died as the demonstration of God’s saving love. So who did Paul have in mind when he wrote this? All people, or those who believe? If Romans 5:8 stood alone with no surrounding context, perhaps you and we and us could be addressing every single person who just so happened to read it. Many pastors and teachers interpret the verse this way, as if it did stand alone as a universal address to mankind. But when we read the passage in its context, we learn that the same people who are loved in verse 8 are justified and saved in verse 9, reconciled to God in verse 10, and exulting in Christ in verse 11. As we read further, we find that they have died to sin (6:2) and have been buried with Christ in baptism (6:4). These same people will “overwhelmingly conquer through Him who loved us” (8:37). Nothing in all of creation could ever separate these people from “the love of God which is in Christ Jesus our Lord.” Because God loved them, and because Christ died for them as the expression of God’s love, they cannot be lost! (8:38-39). Unless no one can be lost, this love cannot be for everyone. Between Romans 5:8 and Romans 8:39 there is no change in the identity of the group designated by the pronouns we, you, and us. Since these people can never be separated from the love of God, they cannot possibly be all people everywhere, the majority of whom will suffer eternally under the same God’s wrath (cf. Matt. 7:13; 25:46), separated forever from His love. The pronouns we, you, and us in this extended passage, including 5:8, clearly refer to those who have been or will be saved—and no one else. And you were dead in your trespasses and sins, in which you formerly walked according to the course of this world, according to the prince of the power of the air, of the spirit that is now working in the sons of disobedience. Among them we too all formerly lived in the lusts of our flesh, indulging the desires of the flesh and of the mind, and were by nature children of wrath, even as the rest. But God, being rich in mercy, because of His great love with which He loved us, even when we were dead in our transgressions, made us alive together with Christ (by grace you have been saved), and raised us up with Him, and seated us with Him in the heavenly places in Christ Jesus, so that in the ages to come He might show the surpassing riches of His grace in kindness toward us in Christ Jesus. If God had chosen to love all people in the same way, His love would have motivated Him to save all people in the same way, just as it did for us. If you are a true believer in Christ, you are a part of this chosen, beloved group. You should read the pronouns we, you, and us with a whole new sense of gratitude for God’s amazing and sovereign grace. Because God loved you, He saved you! Copyright © 2014 Daryl Wingerd. >Does Jesus Believe in You? >Do You Have a Camel in Your Throat?